There are plenty of ultrawide gaming monitors to choose from, but not many cater to both the competitive and casual gaming scene. South Korean manufacturer LG thinks otherwise with its latest panel, the 34GK950F. Can this surpass other ultrawide gaming monitors? There are reasons to believe the LG 34GK950F is the perfect monitor. 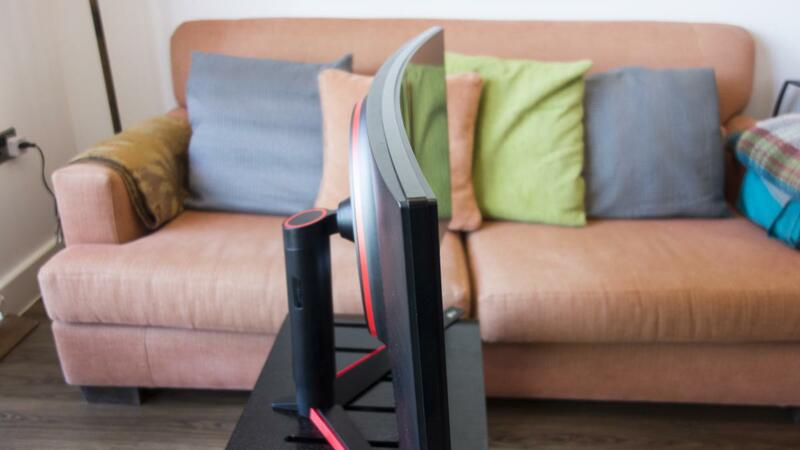 It features a large 34in curved IPS panel that runs 3,440 x 1,440 natively at 144Hz. The inclusion of HDR shouldn’t go unnoticed, either; it’s certified by VESA DisplayHDR. Through Nvidia’s latest driver update, this AMD FreeSync 2 monitor also runs G-Sync. With a striking design, a responsive panel and a large 21:9 aspect ratio, it’s an incredible monitor. The LG 34GK950F costs £1,100. That’s far from cheap, considering the impressive AOC AG352UCG6 Black Edition costs £720. 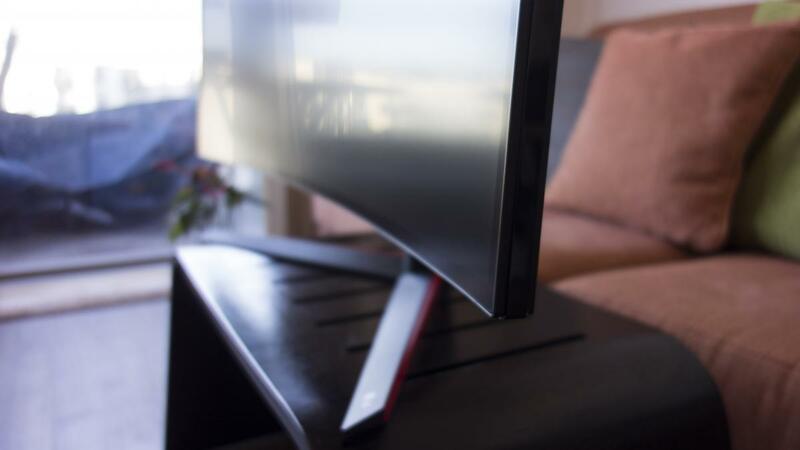 The LG’s main competitor features a responsive ultrawide MVA panel. It runs 120Hz at 1440p, runs G-Sync out of the box and is curved, too. Elsewhere, there’s the £885 Asus ROG PG348Q, which has a curved IPS panel capable of achieving 100Hz at 1440p. Meanwhile, the colour-accurate Samsung C34F791 costs £669 and features a curved 100Hz VA panel that runs at 1440p. Despite its large 34in curved panel, LG manages to keep the monitor’s footprint down to a minimum; the 34GK950F has a four-sided borderless design. Its curved design adds immersion, too. 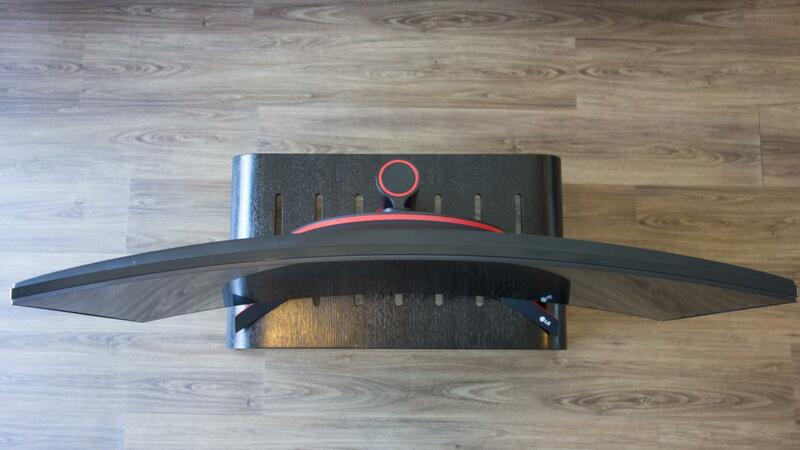 A triangular plastic base holds up the monitor and provides height adjustment, tilt and swivel. A centre-weighted joystick resides along the bottom edge of the monitor to provide quick access to the comprehensive set of menus that lie within the onscreen display. The OSD itself is responsive and logically categorised. 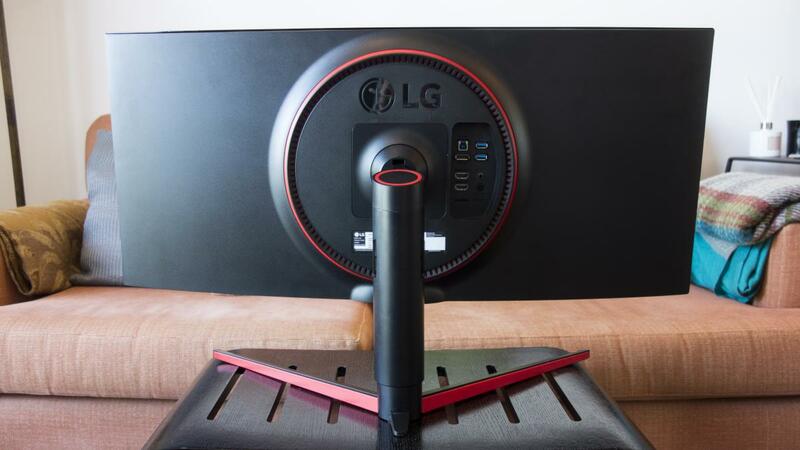 As for design, LG opts for a gaming-centric look, with a black and red colour scheme. 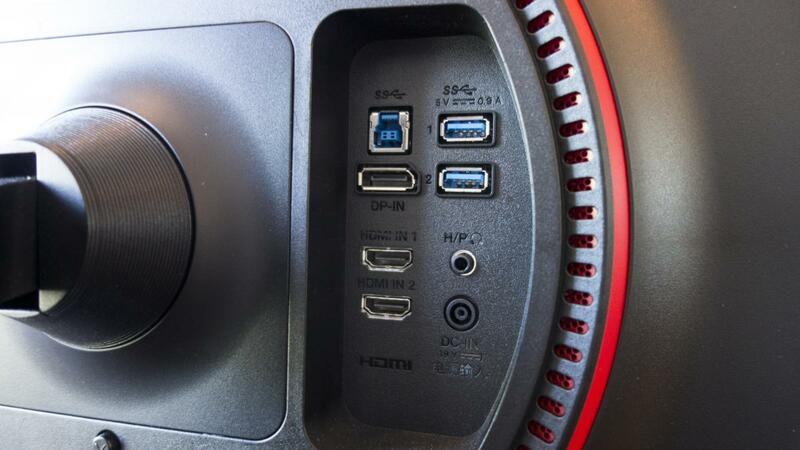 At the back, there’s a large circular protrusion that houses the monitor’s ports: two HDMI 2 and a DisplayPort 1.4 video input; a USB Type B input that acts as a hub for the two USB 3 Type A ports that reside beside it; and a 3.5mm headphone jack for audio output. There are no built-in speakers. The 34in ultrawide Nano IPS panel runs at a max resolution of 3,440 x 1,440 at a 10-bit colour depth (8-bit and FRC). The monitor comes pre-calibrated out of the box – there’s a printed calibration report in the package. I set the monitor to sRGB through the OSD and found the results quite spectacular. Tested with the i1 DisplayPro calibrator, the 34GK950F manages an impressive average Delta E of 1.25. sRGB gamut coverage sits at a respectable 92.2%. To put that into perspective, its rival, the AOC AG352UCG, manages 1.85 and 99.3% respectively. Numbers aside, the LG looks incredible and has more vibrant colours to the naked eye. As for brightness uniformity and backlight bleed, they’re both respectable. There’s a 17.12% variance from the centre point, and the backlight bleed is tolerable even in a pitch-black room. Certified for the VESA DisplayHDR 400 standard, the 34GK950F manages a peak SDR brightness of 393cd/m2, but switch to HDR and this figure goes up to 448cd/m2. However, enabling Motion Blur Reduction (MBR) to better your gaming experience will limit that brightness to 235cd/m2. Despite its impressive colour accuracy, HDR performance is a mixed bag. I use Destiny 2 and Shadow Warrior 2 for my HDR tests on PC and a Samsung 4K Blu-ray player to test dynamic range, contrast ratio and HDR peak brightness. Through the Samsung player, the 34GK950F manages to decode the HDR signal and outputs a stunning image. On Windows 10, however, the result is completely different. Colours are overly vibrant and inaccurate; to my eyes, it looks better in SDR. I’ve reviewed a large pool of HDR monitors, and this is the first I’ve come across that spews out such an odd, artificial-looking image once HDR has been turned on. This might be down to Windows, the individual games or even my setup, though, and it’s hard to criticise the panel when it performs flawlessly using a different source. When it comes to gaming, the LG 34GK950F is truly the best ultrawide monitor I’ve ever tested, even bettering my favourite: the AOC AG352UCG6 Black Edition. LG’s 144Hz panel is super responsive with Overdrive set to Faster and yet doesn’t suffer from any inverse ghosting, either – a factor that plagues AOC’s MVA panel. To enhance the experience, you can enable MBR through the OSD, but that will limit the panel’s brightness, disable FreeSync/G-Sync, and result in an audible buzzing sound that resonates from the back of the monitor. This isn’t as bad as you might think, though, and only really noticeable if you’re in a super-quiet room. The panel has perceivably low input lag, too, which makes it a perfect fit for competitive gamers. The LG 34GK950F supports AMD FreeSync 2, which means if you’ve got a compatible AMD graphics card, you can enjoy tear-free gaming. I was also pleasantly surprised to find G-Sync working flawlessly. For Nvidia’s technology to work, you’ll need a GeForce 10-series card or above and have it connected through a DisplayPort cable. HDR also works alongside both technologies. If you’re willing to compromise on this panel’s responsiveness, higher refresh rate and AMD FreeSync and HDR support, it’s worth considering the cheaper AOC AG352UCG6 Black Edition, instead. 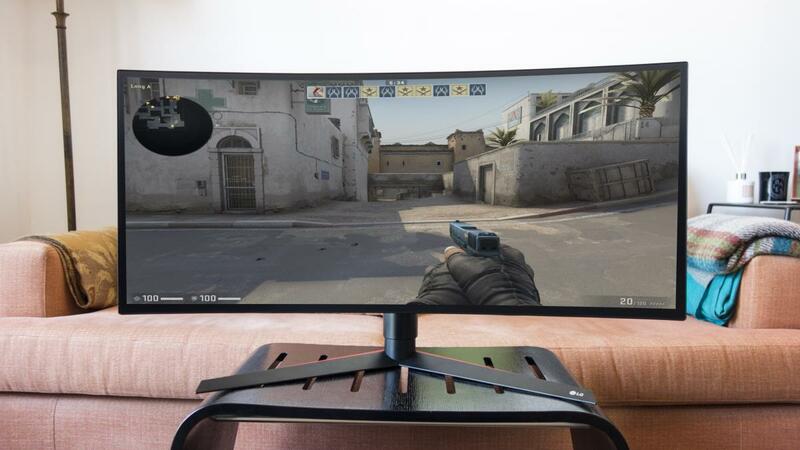 If, however, you want a monitor with a responsive 144Hz 1440p curved IPS panel that’s suitable for competitive gaming; is colour-accurate; supports HDR; and works with both AMD FreeSync and Nvidia G-Sync, you shouldn’t let the LG 34GK950F pass you by. It’s simply the best ultrawide gaming monitor money can buy.